By coincidence or unknown heavenly purpose, 2018 has been a year of gaming anniversaries: multiple games which have had an impact on me are celebrating something. The oldest of them is M.A.G.U.S., Hungary’s most popular role-playing game, now 25. M.A.G.U.S. is both an AD&D imitator and its own thing, and its effects on the local gaming scene has been tremendous, even though the original publisher is long defunct, and no popular edition has been released in a long while. I have had a conflicted relationship with it, and my tastes are often in opposition to the surrounding play culture, but I recognise its basic appeal. But more on that in a later post. The second game is Thief: The Dark Project. Thief is not an RPG, but it has captured my imagination like no other computer game (except maybe Wizardry VII). Thief is going to be 20 at the end of November, and I will, again, write about it a bit later (right now, I am working overtime to have my anniversary fan mission playtested). The third game is closer to this blog: it is none else but Swords & Wizardry. Matt Finch’s take on OD&D is 10; there have been several edition, a boatload of modules, and it has an enduring popularity as one of the simpler, easily moddable old-school rulesets. But this article is about a different game: mine. Accordingly, most of this is inevitably personal, and none of it is an objective, outsider’s view. Sword and Magic (“Kard és Mágia”) shares its name with S&W, and by some unseemly miracle of timing, they share a release date: both were published on October 15, 2008. There is an abbreviated English-language version of the basic mechanics, but this is not really the full game, which is a complete RPG in three booklets with some 190 very densely typeset pages (and no illustrations whatsoever). The real game is in those details. 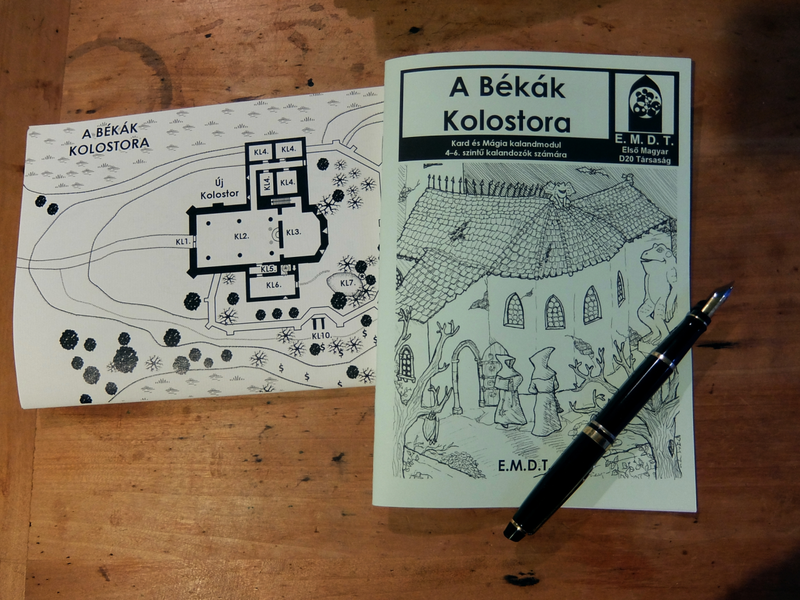 Sword and Magic, which I would be ill advised to abbreviate, was published as an effort to introduce the idea of old-school gaming to the Hungarian gaming scene, in the form of a free ruleset, and a range of fan-made adventures and supplements. This is a plan I had had since at least 2003: at that time, I published a homemade d20 module (The Garden of al-Astorion), but never followed up on the initial effort. But the idea, inspired by Judges Guild, Necromancer Games, and their ilk, was always there: I envisioned people sharing and sometimes selling their own home-made content online and at conventions, and creating a creative community from which all could benefit. The effort was in part borne of the enthusiasm to share an exciting discovery (the old-school playstyle, then newly rediscovered, and still in the process of taking shape in discussion and flame wars around the net). But it was also an effort to get away from the top-down content creation model dominating the Hungarian RPG scene, where amateur efforts had died off to yield to a supplement treadmill mainly consisting off – no offence – unplaytested, unplayable, and often actively play-hostile rubbish. I felt like an outsider in that world, but recognised there were a lot of other gamers who would appreciate something different. After all, I could sell my group on the idea – why not the others? Sword and Magic was created around the same time as the first Castles&Crusades playtests. It arose from the same discussions, but ended up going in an entirely different direction. Ironically, so did OSRIC, the legal precedent for retroclones: our disagreements were wide, and often very acrimonious. Sword and Magic is mechanically closer to the idea of a “d20 light” system than a faithful retroclone like OSRIC, and makes much fewer compromises towards recreating a specific “AD&D feel” than C&C. It also has a simplified skill system, which neither of the other two games ended up adopting, and which dyed-in-the-wool old-schoolers tend to scoff at. However, it guts the 3.0 rules without mercy, and cuts out much of the game’s subsystems (Feats, most classes) and mechanical complexity (almost all special cases, the byzantine rules to stat monsters and NPCs), and creates a game that is medium-powered, dirt simple, and sword&sorcery-flavoured (much more than any of the big old-school systems, but not in a purist way – people have used it to play on Titan, the Fighting Fantasy world, and there is a very elegant Middle Earth-focused variant). It is also a game you can hand to a new player, and have them playing in your game in about 15-20 minutes (real-life statistics). Sword and Magic was mostly system complete by 2006, along with its Monsters & Treasures booklet, but took two more years to publish due to the third. I spent two years writing and polishing Gamemasters’ Guidelines, a comprehensive, bottom-up guidebook on gamemastering, from running a game to designing adventures, campaigns, and fantastic worlds (as well as a treatment on different playstyles, pulp fantasy genres, a brief domain management system, and a set of random tables). Nobody had really done this before in Hungary (actually, very few have done it in the US either – most games traditionally gloss over teaching you GMing in a structured, bottom-to-top way), and it took a while to get right. I think you could probably hand the resulting guidelines to any starting GM, and it would be useful – my hope was that it’d spread beyond the specific system, and prove itself as a general play aid (this did not work in the short run, but apparently, it has had some success over the years). The game was released on 15 October, 2008, with a range of four modules, and the odd techno-Hellenic world of Fomalhaut as its example setting. I consciously chose a minimal design style for the product line, sometimes expressed as a “Tesco Value” (i.e. “store brand”) RPG. There were no illustrations beyond the simple and op-art-inspired cover logos (I live in Victor Vasarely’s hometown, and quite like his geometric style); layout was two-column 9-point Arial; and it was, and to this day remains absolutely free in PDF. (There were no print edition at the time, although I broke the rule with my second RPG, the lavish Helvéczia boxed set, and the new 2018-2019 releases). It received no store distribution, and was entirely dependent on word-of-mouth – local game magazines had died out by the time. For all that, Sword and Magic found its place in the Hungarian gaming scene. Not without the usual acrimony and rejection – quite a lot of gamers had been deeply convinced by the makers of M.A.G.U.S. that “AD&D” was a primitive, worthless game, and it was only suitable (perhaps) for small children… despite having the oldest fanbase of any locally available RPGs. But in the end, you can’t win them all, and acrimony is publicity. Most of the game’s fans came from the wider D&D community, an even mixture of veterans (who had fondly remembered the amateur roots of the local gaming scene) and newcomers (who had discovered it as a new thing). Its most successful years were between 2008 and 2013, when the surrounding forum community was the most active; since then, things have settled down a bit, but it is still surrounded by a fairly good community of active players. It did not take the hobby by storm, but it has established a foothold and legitimised a previously neglected playstyle. Over the years, much of the community around the game have embraced new systems (5e has been a strong rival, although I am arrogant enough to claim my game does the same things better, and with less work), while keeping around some of the game’s ideas and house rules. It has inspired the creation of new rulesets – Kazamaták és Kompániák (Dungeons and Companies, a more OD&Dish game with robust follower rules, now gearing up for a second edition), and more recently, Kardok és Másodteremtés (Swords and the Second Creation, which is Middle-Earth-based). The community has also created its own series of mini-conventions, entirely focused on getting together and gaming for a day: Random Encounters had had 6 events (mostly focused on old-school systems and indie games), followed by The Society of Adventurers, which had its 8th event yesterday (this one also has a robust 5e presence, but this particular instalment was in celebration of our 10th anniversary). As much as anything else, this is what makes me the most happy: inspiring people to go forward and develop their own ideas (the “Fight On!” principle). And of course, keeping it play-oriented, bottom-up, and close to the actual fans. This is our game; perhaps not the largest in town, but it is ours. What has the anniversary meant for English-speaking gamers? Well, Echoes #04 is going to be slightly late, an early 2019 release. Beyond my day job, a lot of my time has been taken up by my Thief mission for the 20th anniversary contest (now in late playtesting stages, to be released in early December), and four adventure modules. One of these, Cloister of the Frog God, a 40-page wilderness-and-dungeon module, has already been published. This module has a complicated history. It comes from my old, never released Tegel Manor manuscript, which I largely cannibalised for this module, and later for my upcoming megadungeon, Castle Xyntillan. (Note, bits and pieces may turn up in Frog God Games’ recently kickstarted take on it – but that one is mostly going to be Bill Webb’s work, and I am interested in what that fiendish mind will come up with!) The Cloister dungeons were published in the Frog God edition of Rappan Athuk (it is one of the wilderness locales), and will also be part of the new, revised 5e volume. Accordingly, I am not going to publish it as a separate module. However, the wilderness section will become a standalone adventure, and the main feature for Echoes From Fomalhaut #04, with an excellent Matt Ray cover, and illustrations by Andrew Walter and Denis McCarthy. If you speak German, the whole module is going to be published in a special issue of the Abenteuer fanzine (Settembrini will be able to tell you when). But there is more. As part of the anniversary, my friends in the community organised a Sword and Magic module writing contest, with me as the judge. The three submitted entries were all worthy of publication, with very different takes on the game and its concepts. They include Murderous Devices by Mátyás Nagy, a sinister murder mystery set in a French Caribbean town (not unlike the Freeport series, the module doubles as a city supplement); The Enchantment of Vashundara by Zsolt Varga, a surreal adventure taking place on the home plane of a god in trouble (with an original and well-realised perspective); and The Lost Valley of Kishar by Gábor Csomós, the best damn lost world adventure I have seen. These adventures will all see publication, in both print and PDF (and this time, with worthy illustrations), and the latter two will also receive an English translation, one in Echoes, and one as a standalone (Murderous Devices, while very cool, lies a bit outside the scope of EMDT’s thematic focus). I am confident people will love them when they see them. Contest winners: Coming 2019 to your gaming table! This is a long overdue review of a module that deserves more attention. I had planned to review it as soon as I read it in the Spring – but misplaced my copy, which only turned up again at my weekend house as I was readying it for Winter. So here it is, a bit belatedly: a great AD&D module based on the author’s personal notes from the 1980s, given a new polish and some expansion and rewriting. It is both a good document of the way high-level AD&D was often played (I remember fairly similar, although less good dungeons from a very different time and place), and something that has excellent playing value today. It should be no surprise the module is good. I have known Anthony’s work since the early 2000s, when he created some of the best Thief fan missions of that time, with a signature design style featuring expansive, sinister cities, labyrinthine plots, high drama, purple prose, and brooding sluts. He had later worked as a level designer on various computer games including the Dishonored computer games – again, a standout series – and he has recently published a range of AD&D supplements, with the same imagination and attention to quality. 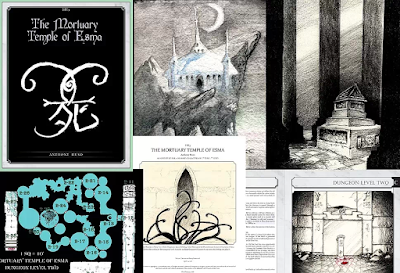 As acknowledged in the Foreword, The Mortuary Temple of Esma was inspired by the eerie and strange Forgotten Temple of Tharizdun, the “White Album” of Gygaxian fantasy scenarios. Tharizdun is the most Lovecraftian AD&D module in a line which had always drawn generously from Lovecraft, but this time without being imitative: it conjures the same ideas of wrongness and blasphemy while constructing its own disturbing imagery. It is also a tough meatgrinder of a module, with deadly battles to test a hardened adventuring group; not to mention how much of the content is hidden in fair but progressively more obscure ways. Finally, it has art completely outside the established AD&D style, so much so that it feels like a weird third-party bootleg to a mainstream family game. I bring this up because, beyond the acknowledgement, Mortuary Temple is to Tharizdun what Tharizdun is to Lovecraft: a homage, but an original one which carries forward the general idea while following its own path. The design features I noted for Tharizdun all apply to the Mortuary Temple – in their own natural context. What the module offers is a three-level dungeon underneath the mausoleum of an elf lord (for four total levels). It is somewhat a mixture between a monument to love similar to the Taj Mahal, a testing ground, and a place to bury unpleasant cosmic secrets. It has its own strong style, featuring a clash between lost beauty and unwholesome corruption – not only in the place’s trappings, but the content of the encounters. Accessing the mortuary temple’s secrets involves not just careful discovery, but making sacrifices and wagering one’s life and belongings. It certainly has strong choices and consequences – and the rewards are artifact-level magical treasures both iconic and powerful. This is a module for a large party of characters who have grown into their stature and earned their experience levels and magic items (it is not a low-magic scenario either – it is ideal for groups who know how to exploit two wands of Orcus and three hands of Vecna). Whatever the outcome, it will be a memorable adventure. It pays off that the author knows and respects the AD&D rules without becoming their creative servant. The module leverages this knowledge to build a deadly gauntlet of encounters with powerful and resourceful enemies who know and exploit their environment (without being omniscient about it). The top level alone is a brutal battleground, which will test a party’s mettle before they can descend to the dungeons. The encounters mix the familiar with the new – well-known AD&D monsters with original creations (or old mainstays given a new spin). The following levels are more focused on puzzles and smaller mysteries, while the final one is once again a brutal tactical slaughterfest (note, the module practically requires a battle mat or a table setup to run fairly). The encounters are puzzling mini-scenarios on their own, from forgotten tombs to a nightmarish underwater realm and a place of emtombment forgotten by the outside world, and beyond the scope of what one would expect from a sacred elven resting place. There are two aspects of the module I find less good (and the reason why it did not receive the rare five-star rating despite being close to it). First, while the individual encounters are almost always excellent, the core puzzles to progress deeper into the module feel mechanical, a bit like CRPG quests instead of D&D’s creative problem solving (although the module predates most actual CRPGs). I think these are the artifacts of 1980s play which did not age so well, even if they are, in fact, authentic (here, Tarizdun has stood the test of time much better). The second reason is that the two final levels are somehow less inspired than the materials preceding them. This is no accident, since the original group of players never actually reached them, and the magic of playtesting – the transformative force which puts the GM’s materials into their final context – is not present. The adventure is presented in a fairly easy to follow format, although I suspect table use would require a fair amount of underlining and a bit of cross-referencing due to the material’s interrelatedness and complexity. The prose, when it comes to the brief but heavy descriptions, is sort of a familiar trademark: “Shod in plated steel, gallant valves of white stone hang picturesque, but unsecured. The wind whimpers and, across the walls, curtains of unchecked clematis flutter and sway. No longer square, the doors pivot on huge pins, making ravenous sounds where stone brushes stone.” (Compare this with the introduction to Calendra’s Cistern, a Thief mission from the year 2000 – some things are reassuringly constant.) It is not long, but it is as purple as it comes – and yes, there is ancient elven love poetry, an almost disturbing amount of it. On the other hand, the information in the location key is broken down sensibly, the various forms of highlighting and side boxes are helpful, and the whole thing is well put together. I usually don’t review production values, but like Tharizdun, Mortuary Temple features a non-standard art style featuring the author’s pencils and crayons, mostly greyscale with rare dashes of colour – fitting the mood of an original module. It is pleasing to look at, as are the maps – which are original, with digital enhancements. 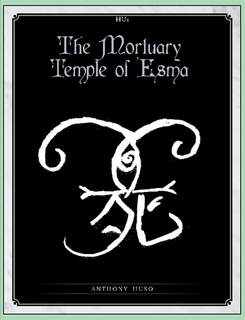 The Mortuary Temple of Esma is among the best releases of this year, and even its slight weaknesses should not detract from its power of imagination and skilful execution. It is as good as deadly mid-to-high (but more emphasis on “high”) level AD&D gets. This publication credits its playtesters (or at least it seems so from the Special Thanks section).